Heather Hodnett graduated from OSU in Spring 2010 in Exercise and Sports Sciences. 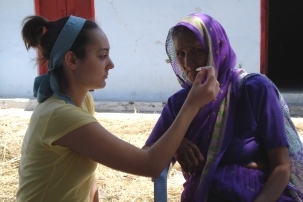 She went to India in Spring ’08 through the IE3 Global Internship Program, and spent ten weeks as a Child Family Health International intern, visiting various cities and villages in India to gain professional medical experiences. Two years ago today, I was finishing the last week of my IE3 internship in northern India. I think about it often enough that it may have ended just two days ago. I expected to reflect upon my IE3 experience directly after my return and for years to come, but my reflection has been deeper than I initially imagined. In fact, I chose to write my University Honors College (UHC) thesis based on my IE3 internship, and therefore, these past few months have been a time of sustained and obligatory – though welcome and insightful – reflection. My days in India consisted mainly of observation in various types of medical clinics and public health facilities scattered throughout the northern region. I knew before I left Oregon that I would likely use some facet of my experience as the foundation for my thesis, so I took handwritten and mental notes each day and typed them into my computer journal each night. Despite my acute awareness of my daily observations and experiences, it still took me quite a bit of time after returning from India to actually figure out what aspect of my internship I wanted to focus on for my thesis. I noticed countless differences between the healthcare system in India and the US; some ways which seemed safer and more sensible and some which seemed less. As expected, I also noticed how the greater Indian society influenced the practice of medicine and the health outcomes within the northern region. This became the basis for my thesis: The Medical Culture of Northern India: A Visitor’s Perspective. My research for the thesis was two-fold: anecdotal research based on the things I saw and did during my days in India, and literature research to validate and enhance my observations. This literature research opened my eyes to so many facets of Indian life and the culture of healthcare that I did not even pick up on during my ten weeks living there. It is hard to imagine I missed so much of the daily happenings while I was living and working in the middle of them, but I never would have made this realization had I not done some exploration upon my return. My experience ignited a flame of interest and curiosity that I took the time and energy to really investigate. Having done so, I now understand so much more about what I saw and why things happened the ways they did. If there is one thing I discovered by writing my thesis based on my IE3 internship, it is that my education about India and the country’s healthcare system did not stop when I got on the plane to leave. Nor should it have. My advice to past, current, and future IE3 interns is to keep up on happenings in the internship country, actively learn more about the country upon return, and apply the new information to memories of the actual internship. Above all else, I learned through this process just how much more there is to learn. I urge IE3 interns not to let the experience and the education end just because the internship ends. The reflection process should be a lifelong one – after all, (I’m sure most IE3 interns agree) the IE3 experience is a life-changing one. Posted in IE3 Global Internships, India, University Honors College. Nice post, Heather. 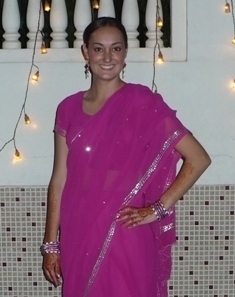 I also interned in India – Calcutta actually – so it was really nice to read this. Whether or not there is even a ‘culture of healthcare’ at least in the way we think about it, I’m not sure though. For me it was very tough at times. What a wonderful reflection on your CFHI/IE3 program, Heather! Nice .. I must say you had a good stay at India . India is country of people starving from medical problems.